Backward Classes Welfare Department, established a new Society MAHATMA JYOTIBA PHULE ANDHRA PRADESH BACKWARD CLASSES WELFARE RESIDENTIAL EDUCATIONAL INSTITUTIONS SOCIETY (MJPAPBCWREIS) in the year 2012 with a view to bring the Backward Classes educationally on par with other developed communities and to achieve a just and egalitarian Society. At present, 41 BC Residential Schools are functioning in the State , of which 21 are meant for Boys and 20 for Girls. Out of 41 schools, 10 Institutions are meant for the children belonging to fishermen community. 3 new schools in Ananthapuramu district and 6 schools for fishermen children and 2 junior colleges have started functioning from 2017-18. Admissions have been started in Junior Intermediate in 12 Residential schools upgraded to junior colleges at the following places. For Boys: MJPAPBCWR Jr. College, Simhachalam, at Vishakapatnam district , MJPAPBCWR Jr. College, Mopidevi at Krishna district , MJPAPBCWR Jr. College, Nizampatnam at Guntur district MJPAPBCWR Jr. College, Kota and MJPAPBCWR Jr. College, Doravarisathram at SPSR Nellore district and MJPAPBCWR Jr. College, Lepakshi at Ananthapuramu district. For Girls: MJPAPBCWR Jr. College, Thanam, at Vishakapatnam district , MJPAPBCWR Jr. College, Nellimarla at Vizianagaram district ,MJPAPBCWR Jr. College, Nandalur at YSR Kadapa district , MJPAPBCWR Jr. College, Arekal and MJPAPBCWR Jr. College, Nerawada at Kurnool district and MJPAPBCWR Jr. College, Teklodu at Ananthapuramu district. The ratio for admission of students into BC Residential Schools: BC-A: 20%, BC-B: 28%, BC-C:3%, BC-D: 19%, BC-E: 4%, SC: 15%, ST: 6%, EBC: 2% and Orphans: 3%. With regard to Fishermen Schools: 46%, BC-A: 7%, BC-B: 10%, BC-C: 1%, BC-D: 7%, BC-E: 4%, SC: 15%, ST: 6%, EBC: 1%, Orphans: 3%. During the academic year 2017-18, 1923 students appeared for SSC examinations.1881 students passed with a pass percentage of 97.81%. Out of 28 Schools which sent Students for the 10th Class Examinations, 20 schools achieved 100% result.36 students have achieved 10/10 GPA. All the BC Residential Schools in the State follow English as the medium of instruction. Yearly calendar is being implemented to impart quality education to the students. Computer labs have been set up to provide computer education to the students. Students are encouraged to participate in curricular, co-curricular and extracurricular activities. Students from 5th standard to 10th standard are given Rs.1250/- per month towards diet charges. Students of Intermediate are provided Rs.1400/- as diet charges.Cosmetic charges have been enhanced @ Rs. 100/- per month for Boys of V and VI classes, Rs.110 /- per month for Girls of V and VI classes and Rs.125 for Boys of VII to Intermediate level, Rs. 160/- p. m for Girls of VII to Intermediate level. Hair cutting charges have been enhanced @ Rs.30/- p.m. for the boy students from 2018-19. 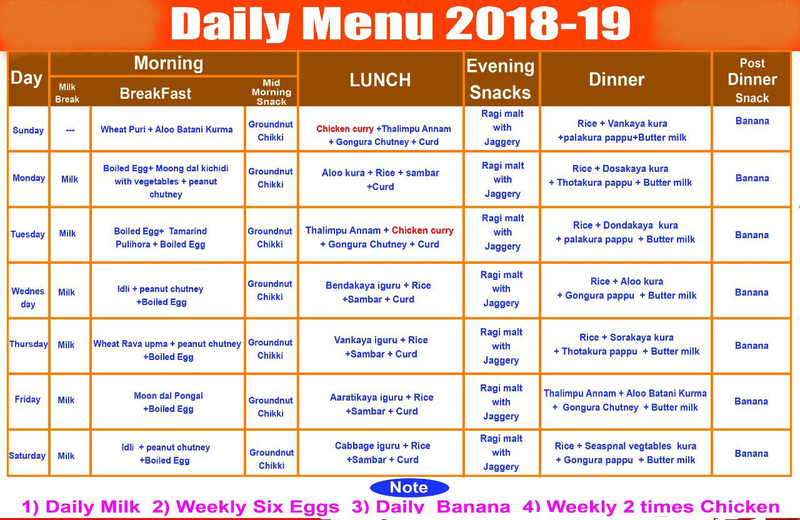 •	Add Opening Balance Entries of menu list..
•	Add Consumption entries of breakfast, lunch, dinner, snaks for list of menu items.